Popcorn, the cookie and the toffee/caramel apple. Three of the kings of outdoor vending in Disneyland Paris, a resort with, in fact, very little variety in its snacks and treats from street kiosks. 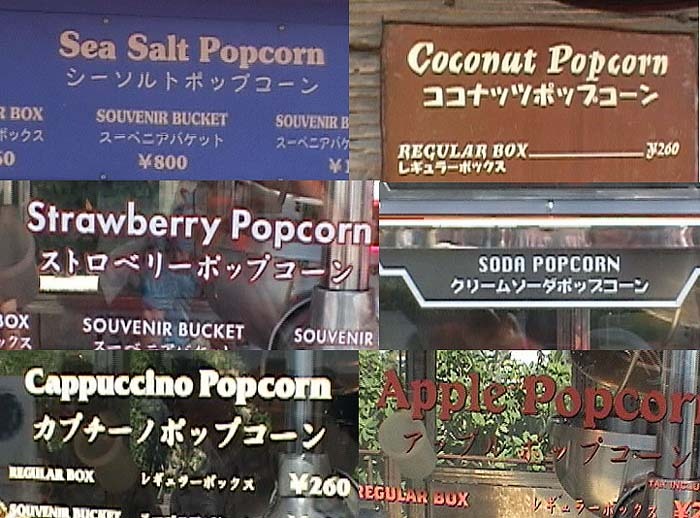 The flavoured popcorn of Tokyo Disney Resort has yet to hit the parks over here, whilst the famous churros of Disneyland Resort have yet to oust the tasteless, pre-packaged “trio of doughnuts” from its unwelcome place on so many menu boards. Is all that about to change? For a couple of months at least, yes. Famous French chef Thierry Marx has agreed to reinvent three of the parks’ staples using modern cooking techniques and some of his “molecular” tricks — a style of cooking where the science behind the process is as important as everything else. Perhaps he’s the French equivalent of Heston Blumenthal in the UK, only tackling popcorn and cookies rather than animal parts. A press release and a series of photographs have been released today. Après le succès de la Pâtisserie Ephémère en l’honneur des bûches « haute couture » de Chantal Thomass, ORA ITO et Vanessa Bruno réalisées par Sébastien Gaudard, Disneyland Paris régale à nouveau les papilles avec une toute nouvelle expérience préparée par Thierry Marx, Chef emblématique de la cuisine moléculaire. A l’occasion des fêtes de Noël, Thierry Marx présente trois créations inédites dans l’art de la gourmandise et de l’innovation. Le pop corn, la pomme d’amour et le cookie : trois plaisirs sucrés transformés grâce à une nouvelle interprétation qui promet de réveiller tous nos sens. A savourer uniquement dans les allées de Disneyland Paris. La pomme d’amour : « Souvent trop dure, j’ai voulu redonner à la pomme d’amour une certaine douceur en créant une pulpe de pomme verte, enrobée d’un sucre léger beaucoup plus diététique ». Le pop corn : « Avec cette nouvelle interprétation, le pop corn est caramélisé en différentes cuissons avant d’être floqué d’une savoureuse couche de chocolat ». Le cookie : « Ce dessert très enfantin préparé par les mamans, j’ai souhaité le transformer d’un biscuit dur en un biscuit moelleux grâce à de la crème de cookie ». Passionné de « street food », le Chef étoilé réputé pour ses jeux de texture et de température a tout naturellement souhaité présenter ses trois créations sur un bâton, à l’instar de sucettes à croquer. Thierry’s new Toffee Apple, Pomme d’Amour, tries to address the usual too-hard-to-bite snack by mashing and pulping the apple and then coating it in a lighter sugar, making it a little healthier. The new Popcorn treats are caramelised using various techniques and then coated in a tasty layer of chocolate, resulting in an extra-large clump of chewy, chocolately goodness. Finally, the humble Cookie has been reinvented with a softer, chewier bite than a regular biscuit thanks to extra cream and rich dough, all dipped in cookie crumbs. As you can see, the three special snacks exclusive to Disneyland Paris are presented on sticks as special tasters and will be available alongside the regular versions, as a seasonal special, during the Christmas events at Disneyland Park from 8th November 2009 to 5th January 2010. No specific locations have been stated. And the price? An online article published just in advance of the press release states… €7. Seven Euros! For one stick? For two or three? It’s not clear. oh well better put off those dreams of fitting into the little black dress for another year then, I know someone who is going to simply love those! My mouth is already watering looking at this pictures! The toffee apple needed improvement, but the other two? Will this smallish clump of popcorn go for the same price as the old bucket? And why mess with the classic cookie? Why 5th January? The christmas season is on until the 6th , isn’t it? I think that food is the worst aspect of disneyland. Everything in the whole entertainmentpark is enjoyabale, but the food is almost everywhere of bad quality. Not only are the prices very high, in every restaurant you get the same fries, very little and very salty. We were there last januari and had two evenings meal in mcdonals, the only place where the food was ok and not too expensive. @Nicolai: Yes, Christmas ends on the 6th. No idea why the online article linked above states the 5th, they might have just got it wrong. The official press release doesn’t mention any dates.